Naatak company is formed by a group of theater enthusiasts of Indian origin, in the San Francisco Bay Area. Since it’s founding in 1995, Naatak company has made huge strides in prominence and stature by bringing quality live theater, with Indian and Indian-American themes, on stage, in the bay area. Naatak has now introduced season passes to enable regular theatergoers the convenience and price deal, for its outstanding performances. The current play “Party” is based on original Marathi play, written by Mahesh Elkunchwar, in 1976. Directed by Ravi Bhatnagar and Alka Sippy, the play is meant as a satire, aimed at India’s urban elite. Based on some comments from my friends who have seen the original play in Marathi and/or the Hindi movie that came out in 1984, it was a highly intelligent satire of the pseudo-elite, the patrons of the arts and literature who nevertheless lived hypocritical lifestyles and held conflicting values. The acting by a big cast of almost a dozen people in this play is fantastic, as has been typical in all Naatak plays. The scene is the party hosted by Damyanti Rane, in honor of a well known playwright, Diwakar Barwe, who is at the pinnacle of his success. Basab Pradhan, as doctor who is attending the party because he is Rane’s friend, has done a beautiful job of delivering his satirical lines, with a straight face. Referring to Rane’s guests, he tells Rane at the beginning of her party, “why must you go on collecting these nut cases?” Sindu Singh and Vijay Rajvaidya are fabulous as Rane and Barve, respectively. Only as the party progresses, the skeletons and the hidden agendas, the fears, and the disillusions harbored by these party-goers become apparent. Barwe confesses to Rane that his work has not had much originality and he has held his top spot only because he defends his turf and discourages other budding writers. His gorgeous live-in girlfriend, Mohini, a former actress (nicely played by Priya Satia), is in fact, addicted to alcohol and lives in the imaginary world of being deeply in love with Barwe, though he does not love her any more. Snigdha Jain has done a great job with superb set design. Manish Sabu and Anubha Prakash’s work with English sub titles is excellent. If you are not well versed in Hindi, you won’t miss the fun because English sub titles appear in a timely way, right above the stage. Asheesh Divetia is perfect in his role as Bharat, a budding writer, who is plagued by insecurities, interspersed with moments of great insights and clarity. Nandita Kant, in the role of Vrinda (Rane’s plain looking daughter and an unwed mother) seems to be the only genuine person at the party. She spurns unwanted advances from her mother’s friend and suitor, Agashe, played by Puneet, before she confronts her mother about her superficial world that feels so alien to her. The problem however, is that none of these interactions seem like extraordinary events that make a great story. They also don’t feel like immensely ordinary events that the audience would deeply identify with and would move the audience. They sort of just hang in there. The satire in this play seems to fall flat, the dialogs are not supremely witty, jokes are not rip-roaringly hilarious, and none of the characters display huge depth or intensity. I went to see the play with my friend and her smart, literature enthusiastic daughter, Sonia Mahajan, who is a freshman at a local high school. After the play, I asked her what she thought of the play. “Nothing happened”, she said. I think that about sums up how this play came through. The only things that happen of any consequence, were with a character who is absent from the stage, and whom we hear about from Joginder (Ishmeet Singh), a local reporter. Amrit, a promising writer-poet, is concerned with the plight of the tribal people and in stark contrast to these elitist party-goers, he indicates his commitment to the society through his actions, residing and fighting on behalf of the tribal people, seeking justice for them. 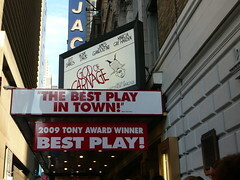 Despite fabulous acting by a brilliant cast, the play is not riveting. Perhaps some brilliance was lost in translation. More specifically however, these pseudo-intellectuals or elites in 1970s India, just seem like ordinary people, with ordinary concerns, and ordinary hypocrisies, in the 21st century, America. At best, “Party” feels like an annoying party one is attending out of obligation and can’t wait to go home. I want to give credit to the NAATAK company for bringing a wide variety of topics, on stage. Not every topic or theme can be perfect and resonate with every member of the audience. The diversity and variation of subject matter serves to enhance the perspectives of Bay Area theater-goers, particularly those interested in themes related to the Indian sub-continent. I have seen the play “Disconnect” when it was performed at San Jose Rep, that will be presented by NAATAK in June. Here is a link to my review –http://bit.ly/14uuKgm and I would absolutely highly recommend it. With NAATAK casting and direction, it is likely to be absolutely brilliant. There will be one or two more shows of “Party” and tickets and/or season passes can be purchased at www.naatak.com.